Visit the Maple Run Tour and Win! The Maple Run Tour is a wonderful way to shake off the winter blues and step out for the day (or weekend!) 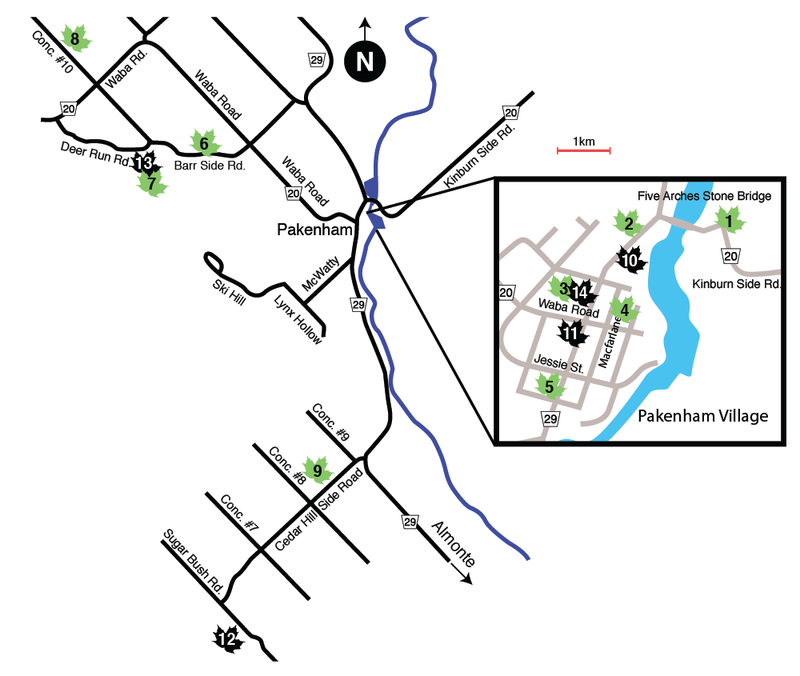 in and around the historic Village of Pakenham. As you make your way from Tour stop to Tour stop, make sure you pick up a Tour Passport. At each Tour stop you visit, simply ask an artist to initial the Passport. When it is time to go home, simply drop the Passport in a prominently displayed sap bucket at any Tour stop. This Passport is your chance to win a $50 gift certificate that you can put towards purchasing any item from any artist on the Tour! And, to make it even more fun, if you visit all 10 stops on the Tour, your name will be entered twice into the draw. Woot! Due to the overwhelming attendance during the St. Peter Celestine Church tour last year, visitors enjoying the 2019 Maple Run Tour are encouraged to once again make their way up the hill to the Church when visiting the Village of Pakenham. Terry Currie, your tour guide, takes you on a remarkable journey inside this historical Church, sharing his knowledge to describe and explain the significances of the Church’s interior décor and exterior influences. The Church was constructed by many talented local crafts people and the construction lasted for nine years. It is only one of three Canadian churches known to retain its remarkable Classic interior decoration, complete with robust statuary, elaborate painting, trompe l’oeil and faux marble finishes. A striking feature of the nave is the original pulpit, built in the form of a huge, heavily ornamented chalice. With its perch on a bluff, you can see far and wide across the Mississippi Valley from the silver bell tower. The architecture of St. Peter’s is quite unusual for the area, and is similar in style to churches in Quebec and southern Europe. A stop at the Pakenham General Store for art, food AND heritage is always a highlight of the Maple Run Tour. Established in the early 1840’s by Archibald McArthur and Robert Brown, the Pakenham General Store is considered to be one of the oldest continually operated general stores in North America. It features both Regency and Classic Revival architectural styles. The store is like a step back in time with its charming wood floors, displays of vintage grocery tins, and original wooden counters, and still sells a range of groceries, including freshly-baked bread, special maple baking, local cheese, and of course, local maple syrup and maple products. And not to forget – sticky buns! 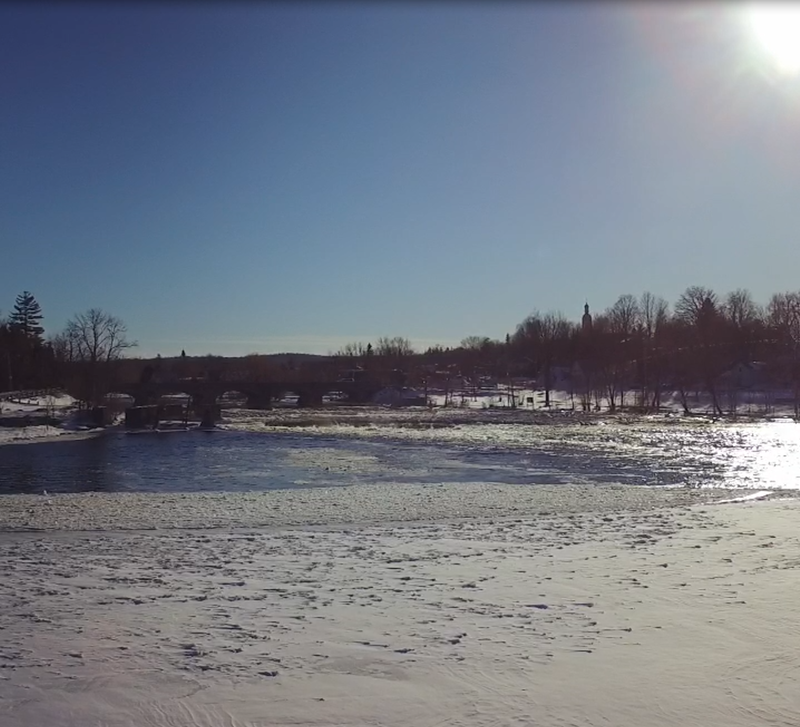 As you wander the wonderful village of Pakenham, make sure to visit the Five Span Bridge at the ‘little falls’. It is one of the Seven Wonders of Lanark County. This bridge is a favourite with artists and is the only bridge of its kind in North America. An explanatory plaque at each end of the bridge provides more information. The Fulton family has been making mouth-watering maple syrup for more than five generations. Fulton’s Maple Syrup, Gourmet and Maple Luscious bath & body products are hand harvested and made in small batches on the family farm near Pakenham. Guests can enjoy three walking trails, guided tours of aboriginal, pioneer and modern-day methods of sap to syrup and dine in the 120-seat cafeteria style restaurant where traditional pancakes, sausages, maple baked beans and more are served. Enjoy horse-drawn wagon and sleigh rides, taffy, face painting, live music, demonstrations and more on weekends and select dates throughout the season. Fulton’s is an avid supporter of the Maple Run Tour and this ‘sweet’ destination is another reason to come on out and enjoy the twists and turns of the tour route! Steeped in a 70 year continuously-owned family history, Scheel’s Butcher and Furniture Store has been a landmark in the Pakenham area. Starting with a horse and cart going door to door, Milton Scheel and his son Gary offered their butchery services to locals and then in the early 50’s, with his wife Lillian, built the present-day building located on the main street of Pakenham. At a time when refrigerated lockers were the norm, the store offered fresh meat and storage. Lockers were replaced with Frigidaire refrigerators and in the 70’s son Gary expanded into appliances and furniture. Today, grandson Marc has taken over the reins. Pictured above are Gary Scheel (Marc’s father), father Milton Scheel (founder of Scheels Butcher shop) and his father Les (three generations). The first settlers came to this area in 1823, to clear land and build shanties, potash works and mills. This set the stage, circa 1840, for the establishment of the village of Pakenham. A Walking Tour of the Village of Pakenham is a brochure that has been produced by the township of Mississippi Mills. We encourage you to pick one up along the tour route and relive life from the 1800s as seen through the heritage buildings and structures that still stand today.